The consequences of fear includes increased risk of defensive practice, where the woman and her family become potential enemies to those providing her care. In addition, the prevailing risk management and 'tick box' culture in maternity services encourages maternity workers to give priority to the records instead of the childbearing woman. These factors contribute to the dissatisfaction felt by those using and providing maternity services, and the apparent lack of kindness and respect. There is however increasing evidence that kindness, compassion and mutual respect improves efficiency, effectiveness, experience and staff morale within healthcare settings. 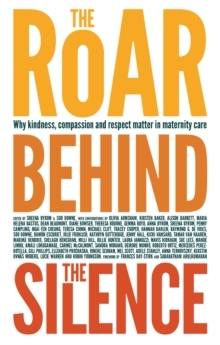 The Roar Behind the Silence provides information, inspiration and practical suggestions to support maternity care workers, policy makers, and maternity care funders across the world in their quest to deliver sensitive, compassionate and high quality maternity services. The book highlights examples of good practice, and practical tools for making change happen, using evidence and stories where appropriate. Edited by Sheena Byrom & Soo Downe, with contributions by Hana Ruth Abel, Maria Helena Bastos, Dean Beaumont, Dianne Bowser, Anna Byrom, Sheena Byrom, Penny Campling, Michael Clift, Hannah Dahlen, Raymond de Vries, Soo Downe, Ngai Fen Cheung, Julie Frohlich, Kathryn Guttridge, Jennifer Hall, Shelagh Heneghan, Milli Hill, Billie Hunter, Mavis Kirkham, Mande Limbu, Amali Lokugamage, Kerstin Uvnas Moberg, Mercedes Perez-Botella, Gill Phillips, Elizabeth Prochaska, Progress Theatre Group, Rineke Schram, Anna Ternovszky, Lucie Warren and Robin Youngson.